A Look At The Cybergenics 60 Day Total Body Building System Kit. Does It Really Work? Is it possible to transform and average to below average physique into an Adonis in only 60 days? Owner Scott Chinery and his Cybergenics research team thought it could be done. That is why they set out to prove that you can add as much as 25 pounds of muscle to the would-be bodybuilder's frame. To do this they placed ads in newspapers to enlist volunteers, men aged 19 to 50. Using the Cybergenics Total Bodybuilding System, this study documented the effectiveness of the program described in the system's manual. It demonstated how, dispite body type, are or size, the program can transform a body into a mass of muscle never thought attainable. According to Dan Gastelu, director of research for Cybergenics: "Over eight weeks of supervised work-outs, aerobic condition and nutritional supplementation proved that even 'weekend athletes' can attain extraordinary muscle mass and strength. In addition, you can significantly reduce body fat, at the same time," he added. Under the watchful eyse of Dr. Steven Crawfors, a sports medicine physician, Curt Carlson, Cybergenics vice president, Dan Gastelu who supervised the study and Franco Santoriello, bodybuilding champion who was training advisor, the research subjects begain the Cybergenics program that would potentially change their lives. Dr. Roger Taylor, the very capable trainer at Gold's Gym in Toms River, New Jersey, was enlisted to work with the study group. He conducted important weekly physicals, routine blood sampling and random urinalysis with Dr. Crawford. Another important aspect of the Cybergenics study was it's visual documentation. To be as through and as detailed as possible, it was decided tha the subjects or "stars" of the study should be photographed and videotaped daily to monitor their progress. The candidates were housed together in Toms River and ate prepared meals as outlined in the Cybergenics manual together. They followed the prescribed workout schedual as a group, "pumping up" at Toms River Gold's Gym . "We supervised this specialized study so that the Cybergenics Total Bodybuilding System was followed to the letter," Carlson said. "When the research candidates begain training, their body types ranged from lean hard gainers to those that needed weight loss as well as muscle definition," he added. When they compleated the training program in 60 days, the candidates not only achieved their physical goals, but all reported a mental heightening, and awareness of how physical fitness drastically improved their daily lifestyles. Mike Bengivenga, age 26, 5 feet 7 inches, was 150 pounds with 16 percent body fat. 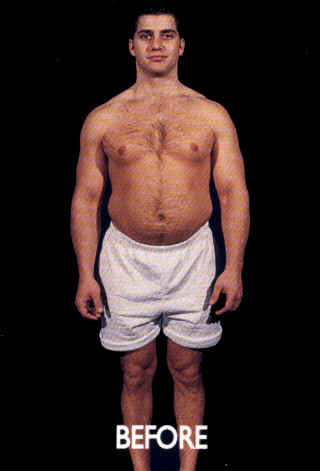 His arms, chest, waist, legs and calves were 14, 36, 33, 22 and 15 inches respectively. By the completion of the program, he weighed 172 pounds, and his body fat was down to 5.5 percent. His arms, chest, waist, legs and calves were now 17, 44, 29, 26, and 17 inches. That's a 36.5 pound increase in lean body mass. Why did Bengivenga join the Cybergnics research study? Mike said he wanted to prove to himself he could attain his personal fitness goals." I had been trying for the longest time to get into shape, and I just wasn't getting results. No matter how hard I tried, I could not gain muscle mass." During the project he could feel his confidence growing as he saw his physique changing. "I saw gains within a week and a half," Bengivenga said. "My body starting changing before my eyes, it was unreal! My drive to get into shape was turning into an obsession because I was seeing results and I simply did not want them to stop. "To this day, I am still making gains. What Cybergenics does is permanently change your way of eating, training and thinking," Bengivenga added. "It puts you in a fitness mindset. You learn a great deal about all aspects of fitness - diet, nutriton, training and supplements." Recently, Mike Bengivenga entered and placed in the Suburban Bodybuilding Championship in Clifton, New Jersey. He is now training for his second contest. Another candidate who took part in the stury is John Gordon. He could not seem to find a method which would allow him to lose fat and at the same time gain defined muscle. At 5 feet 8 inches, 21 year-old Gorden weighted 235 pounds at the beginning of the study and his body fat was 31 percent. His arms, chest, waist, legs and calves were 18, 49, 38, 28 and 17 inches respectively. By the end of the study, Gordon had lost an unbelievable 67 pounds. HIs weight was now 172 pounds and his body fat had shrunk to 9 percent. His arms measured 17.5 inches, his chest was 47 inches, his waist went down to 31 inches. Gordon's legs were now a solid 27 inches and his calves 17 inches. "My family couldn't believe the transformation I was undergoing," he recalled. "Even my face thinned out, and my fat was replaced by muscle." "I've thrown away all my old fat clothes," said gordon. "When I see myself look this good, I know I will never go back to my old body."